Today, I woke up and soon realized there was no way I was going to make the train that would get me to work on time. Keep that in mind, I was already running late. That is a garbage can lid. Now, when I reversed the car, I didn't hear anything being run over so I'm assuming this was underneath the car from the wind and that it must have got caught when I pulled forward. Now, I bend down and try to reach for it to pull it out. It's wedged pretty darn good. I get down on both knees and start to jiggle it around and pull really hard to get it out. NOTHING. I'm thinking to myself, crap. I'm going to miss my train because I can't get this darn thing out. 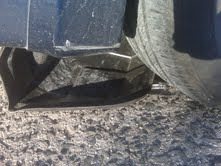 I look and see that's wedged between my muffler and tire. It's folded and ripped so I just can't pull it out because it's caught on something underneath the car that I can't see. I live a block away from my parents and my hubs already left to work, so I decided to call my dad who I know is home. Phone is ringing and he doesn't pick up. Great. I try again myself to take the lid out and nothing. Call my dad again and he picks up! I tell him to drive around because something is stuck underneath the car and I can't get it out! He came to the rescue and it took him about 5 minutes to get it out. It just wouldn't budge. He drove the car forward thinking it would loosen up, WRONG. Finally he was able to yank it out. I gave him big hug and kiss and said thank you! But by this time, I missed my train and the next train was leaving 35 minutes later. Mind you my commute to work door-to-door is 1 hour and half. I arrived at work at 10 am. Not the greatest way to start off a Monday morning, but it could have been worse!